The Zune HD is here! It’s gotten some good reviews but the Macalope thinks Microsoft might be leaving a monetization scheme on the table. Not so the recording industry! Cartoon villains that they are, they will leave no stone unturned in their quest to wring money out of you. And an accounting rule change gives a boost to Apple’s share price. Is that something to be proud of? The big Zune update—the Zune HD—arrived this week and has been garnering good reviews from several sources whose job description doesn’t include blowing smoke up Microsoft’s rear. 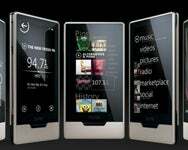 It’s great to have competition, but the Zune HD is clearly a niche product. If you’re a videophile, the Zune HD might be for you, but if you want a more general-purpose device, you’re probably going to want to stick with the iPod touch. Because if you want to play games, forget about it. The Zune actually plays a full-screen ad before you can play your game. Of course, some people like subscription and ad-based systems. Hillbillies mostly. Carnies. But still, they should have a device just for them and kudos to Microsoft for satisfying their needs. Hey, maybe Microsoft could round some of them up and do an “I’m a Zune” ad. The summer carnival season is just about over. Just thinking out loud. You hate us! You really, really hate us! And you said they couldn’t do it. Songwriters, composers, and music publishers are making preparations to one day collect performance fees from Apple and other e-tailers for not just traditional music downloads but for downloads of films and TV shows as well. Those downloads contain music after all. So, let’s say you log onto iTunes and buy the final episode of season 2 of Buffy the Vampire Slayer, which includes Sarah McLaughlin’s “Full of Grace.” You know that scene—it’s a poignant moment after Buffy has been forced to kill Angel and decides to leave Sunnydale to deal with her grief alone. It’s touching and sad and speaks directly to any high school student who’s had to kill their vampire lover. Well, it’s also stealing, buster! You wouldn’t break into a nursing home, beat up some elderly people and steal their pension money, would you?! Well? Would you?! No! So why would you steal music by downloading an episode of a TV show that plays the song under an already obtained license?! These groups even want compensation for iTunes’ 30-second song samples. Oh, come on! It’s practically impossible to parody you now, recording industry! Are you getting the feeling they don’t even want us to buy their stupid songs? Your average crack dealer knows more about sales than the recording industry. You always give some away for free. That’s Sales 101. And, yes, the Macalope should not be surprised after all these years to find that the recording industry did not actually take Sales 101. That’s on him. Have you tried giving your quarterly results using puppets? Fantastic news from the world of accounting! (No, no. Don’t get up.) Turns out the subscription-based accounting rule Apple has been employing for iPhones—the one that’s so gul-darned incomprehensible by them there Wall Street genius-types that Apple actually goes ahead and tells you what their financials would be like if they didn’t use it—has been overturned. Now Apple can report revenue when it’s received instead of spreading it out over the life of the contract. This is almost universally expected to boost Apple’s stock price and, oh, hey, look, it already has! Wow, really, Wall Street? You guys make all that money and an accounting change is going to make Apple’s stock price go up? A change that has absolutely nothing to do with the fundamentals of the company’s business? Boy, if the Macalope were you guys, he’d be embarrassed. Fortunately for you, we both know you have no shame.